All year round Jungle Theatre and other arts organizations have been working with vulnerable youth in the South Peninsula. Much of their work remains unseen. The voiceless are not heard. The treasures of self-expression and group creativity are hidden from the rest of the world. The world spins faster and faster and these children are being left behind. Artists bent on opening up possibilities for access have been creating spectacular public arts in the form of giant puppets, street music, dance, animal masks and folk songs. They have been hidden away toiling in their studio’s preparing for this moment. Finally, the day has arrived for all this creativity to burst forth onto the streets of Muizenberg. It’s late morning on Sunday the 14th of October. It’s sunny with a fairly strong South Easter. People have started gathering near Camp Road on the rich green grass next to the mountain stream in the Muizenberg Park. Excitement fills the air as artists and arts managers surrounded by groups of children carrying puppets, masks and instruments gather from all directions. The eMzantsi crew are arriving thanks to a Golden Arrow bus donated by HCI Foundation. The Jungle Theatre team carry bags filled with refreshments donated by Thundafund supporters. They are followed by more than 100 children who have been practicing dance and songs with artists supported by the Rolf Stephan Nussbaum Foundation and The Learning Trust. Alive Dance Studio participants are getting final adjustments to their glittering costumes. INmotion Studio’s and a team of 10 volunteers are carrying a 9-meter-long snoek puppet. A group of smiling traffic officers are standing in the shade opposite the park and volunteer marshals are being issued colourful flags and luminous bibs. Families with sun hats and little children are also gathering to see the start of the Parade. 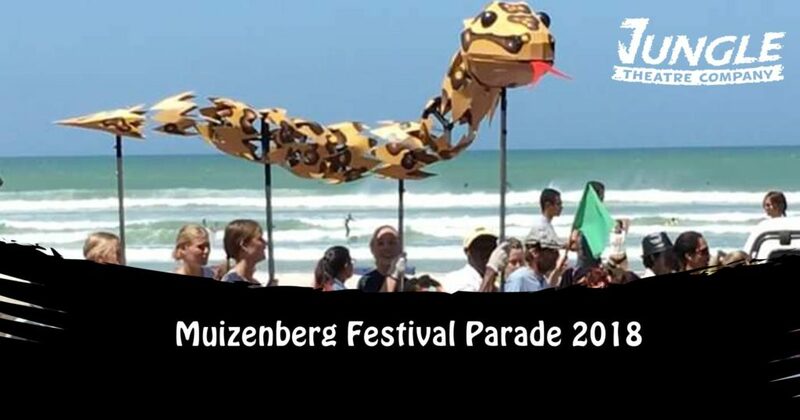 12pm arrives; the green flags are raised into the air and “Boom!” the giant snoek takes the lead, eMzantsi’s Bloka drummers explode into uplifting Cape Town cross Brazilian rhythms, the children pull their animal masks onto their faces and start dancing and singing, the Python puppet slithers out of hibernation and the Muizenberg Parade 2018 has begun. It surges down Atlantic road under the train line until the flashing blue lights of traffic cars guide it into the village and the hustle and bustle of Palmer Road. People come out of their houses getting hypnotized by the magic and follow the irresistible magnetism. The marshals raise the red flags and the parade stops moving forward but erupts into a feast of colour and sound as the music builds and the children dance with the crowd. Green flags return and the parade slithers back over Atlantic road and onto the beach front. Flabbergasted faces come out of restaurants and staggering swimmers are awestruck with their towels around them. The pace is fast and everybody’s hearts are racing. The parade powers back up Atlantic road under the train bridge and back into the Muizenberg Park. Everybody is exhausted. Some are lying down on the grass and a long line of children are waiting for their refreshments. Everybody is smiling. There is an overwhelming sense of relief. We were seen. We were heard. People are proud of us. We are proud of ourselves. We are grateful for all who took part; to our funders who made it possible to commit our time and talents to working with children who need it most; to the volunteer marshals, musicians and puppeteers; to the traffic officers and all the people who came to watch, join the dance and cheer us along. We hope to even more support next year!